Boston Symphony Orchestra and Tanglewood Festival Chorus with Daniele Gatti conductor, at the conclusion of the Verdi Requiem. Soprano Fiorenza Cedolins, soprano; Ekaterina Gubanova, mezzo-soprano; Stuart Neill, tenor; and Carlo Colombara, bass. Also on stage is John Oliver, conductor of the Tanglewood Festival Chorus. I'm just back from vacation and attended my first BSO concert of the season last night. I'll be posting some photos from my vacation in a couple of days. 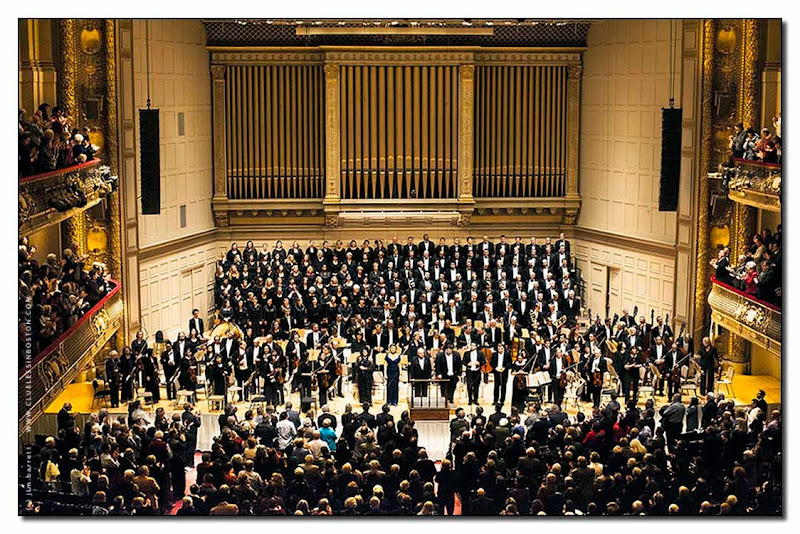 Ah, one of the things I miss about Boston and that area - Symphony Hall and Tanglewood. Must have been a great performance. Fantastic! It has been a loooooong time since I have been able to be at Symphony Hall. Maybe this year I will find a way to go back. Thanks for the information about the Italy festival. I love Italy and will be sure to attend some of these events. Hope your vacation was good. Welcome back! Looks like a nice event. You're coming back with an impressive picture! I hope you had great vacations! Being half Italian, I'm glad to read about this "Year of italian culture"! Outstanding night! Your picture is wonderful!You prepared a great article,thanks for sharing!